Home > Men's Vintage Shirts > Men's Vintage Shirts: 1970s > (L) Mens Vintage 1970s Short Sleeved Pullover Shirt! Tan w/ Brown Stripes! 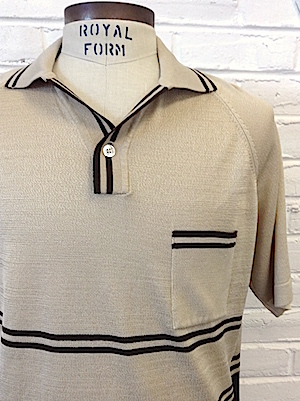 Mens vintage 70s short sleeved pullover shirt. 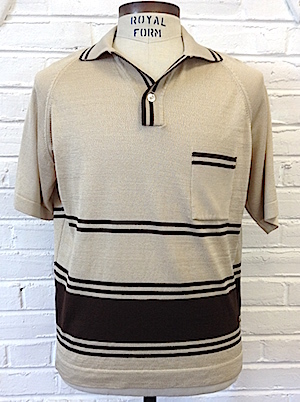 Get groovy in this tan pullover with brown stripes! Has a wide disco era collar with an opening just below it that closes with one pearly white button. Shirt has one patch pocket on the chest and raglan style sleeves. Tagged by JCPenny. Acetate/Polyester blend. Chest: 43" LARGE. Tagged Xlarge, but we are measuring it closer to a large.